Is This What A Belgian Super Mario Bros. Would Look Like? The video game version of The Adventures of Tintin isn't always a platformer, but when it is it feels a lot like a richer, more complex version of the old Super Mario games I love to play. Working your way across the screen as the titular Tintin, down the screen, up the screen, from a side-on view, makes up about 70 percent of the game, Ubisoft tells me. The rest of the time you'll shift gameplay for levels that have you flying planes or getting into sword fights. I didn't get a chance to check out any of the non-platforming elements of Tintin when I saw it here in New York this month. Instead I slid on a pair of active shutter 3D glasses and watched as a Ubisoft Fragdoll played through a couple of single-player levels on a Playstation 3. Even if I weren't already a lifelong fan of Georges Remi's adventurous young reporter, I would have been drawn to the game's look which, while not completely capturing Remi's ultra-clean ligne-clair art style, is still very reminiscent of it. 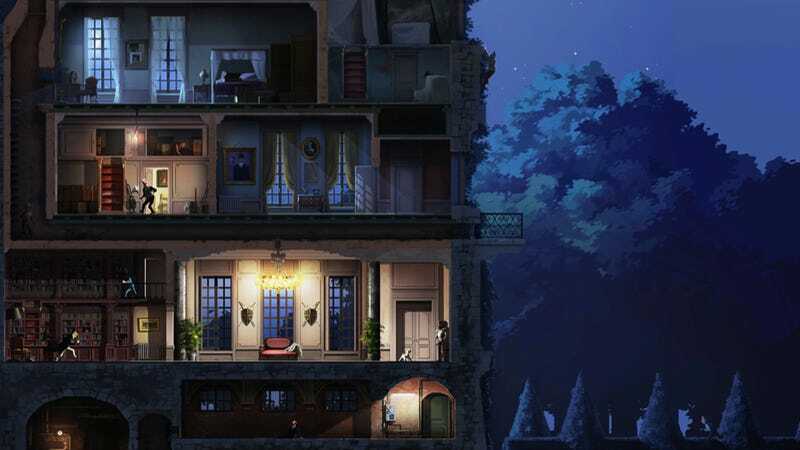 There are times when the gameplay shows just the area that Tintin and his canine sidekick, Snowy, are walking or running through, but chunks of the gameplay I saw also showed a screen filled with rooms and corridors waiting to be explored. In these moments I felt like I was viewing a Belgian version of Super Mario Bros., watching a reporter avoid bad guys, rather than a plumber stomp on Goombas. The game will have more than 20 environments. The ones I watched unfold before me all took place on Captain Haddock's ship, infested with enemies. In the levels, Tintin climbed up and down ladders, jumped between platforms and occasionally took out enemies with banana peels. In one scene, a bad guy stepped on a peel, slid cartoonishly across the room and into a wall, falling backwards onto his back, his legs sticking straight up in the air. I could hear a faint coocoo sound as stars floated about his fallen form. Later the perspective shifted, showing Tintin running toward the screen as water chased him through the hallways of the ship. Further into the level, Tintin has to make his way up to the nose of the now-sinking ship, which is jutting straight into the air. Water is rising as Tintin climbs to safety. Tintin will drown if the water gets to him, we're told. The entire campaign will take under 20 hours to complete and can, oddly, only be played alone. I'm so surprised by this bit of single-player news that later I emailed Ubisoft to verify it was true. It is. Fortunately, the game does include a bit of multiplayer, all found in the game's cooperative mode. The two-player mode has an interesting premise: The level has you playing through Captain Haddock's alcohol-fueled dreams. That helps explain the disjointed nature of the levels and some curious abilities, like being able to turn into a dog when you walk through certain doors. In the cooperative play I witnessed, Tintin, who can use a grappling hook in this mode, was controlled by one player while Haddock, who has his extra strength to rely on, was controlled by another. The level design forced players to work together to make it through a scene. What I didn't get a chance to see was the single-player only challenge mode, which includes a lot of "exotic gameplay elements" I was told. This is also where players will be able to use Kinect or Move controllers if they'd like to. The game is due out around Christmas on the DS, PC, PS3, Wii and Xbox 360.